Neil MacLeod Neil.Macleod3@highland.gov.uk 01847 821531 Seadrift Visitor Centre, Dunnet. Handing in day for Society of Caithness Artists. - Max 5 works per artist. Framed with hanging hooks. LOCAL journalist Noel Donaldson has been getting a flavour of this year's Wick gala 2010, from its programme. WICK's annual gala, which gets underway shortly, promises to be one of the best ever. Traditionally, the festivities will gather pace with the climax to the opening day, on Saturday July 24, the crowning of Queen Angela Gray taking place in the Royal burgh's Market Square. Her coronation takes place at 7pm, and accompanying her, will be her attendants, India Morrow and Lauren Green, her court, Kaitlin Gunn, Kerry Plowman, Abigail Duncan and Kirstin Gunn. The Herald is Aidan Sutherland. This year's guest speaker needs no introduction. Miss Anne Dunnett, the Lord Lieutenant of Caithness, is a "Weeker" 'boarn' and bred, and will doubtless set the scene for a flying start to the festivities. Master of Ceremonies, too, is a kenspeckle figure, Eric Farquhar. Did you start Wick High School in 1965? If you did then we would like to meet up with you in the Seaforth Club, Wick, on Saturday 31st July at 7.30 pm. We have entertainment by way of a 60's disco and a 2-course buffet provided by Wicker's World. Tickets can be had from Turners Shop on High Street, Wick, for �20. Any enquires or tickets by post, please telephone Mary on Wick 605920. We look forward to seeing you there. Join the Highland ranger & Seacoast to explore the Caithness Cliffs from another angle. Get close up & personal with the wildlife. Booking essential, start time may change depending on weather. Waterproof clothing provided. Meet Seacoast portacabin, Wick harbour. If you cannot make the trip then maybe you would like to see some of the Caithness Coast in photos HERE from this trip arranged in 2008 by Caithness Field Club. If you would still like a trip to see the Caithness Coast on any other date contact Caithness Seacoast for the East Coast or North Highland Marine Adventures for the north coast. NHS Highland is holding an open session on - Thursday 15th July 2010 At the Caithness Horizons Education Room - 3:30p.m. – 7:30p.m. Members of the public are invited to come along. You will have the opportunity to meet with the local management team to discuss and ask any questions about the redesign. The Keiss Mini Gala Committee have decided to move their gala weekend to avoid a clash with the big music festival planned for Saturday 14th August at Wick. B Fest Music Festival will be held at Wick Riverside. It is a 1 day outdoor festival on the banks of Wick River. 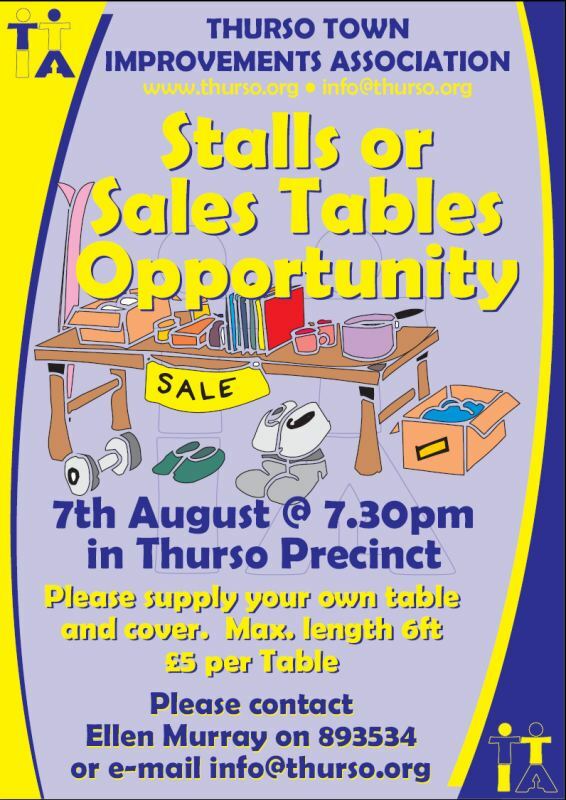 An opportunity for anyone to sell at this event during Thurso Gala week. Get in touch with Thurso Town Improvements to book your stall or table position for only �5 for the day. Crossroads Caring Scotland - Caithness are running their Annual Raffle, to be drawn 1st October 2010. Highland Council Trading Standards are warning all residents to be on their guard when answering 'cold-call' telephone sales calls offering a 'free home fire and security survey', if they agree to a home visit by sales staff. This warning follows on from previous warnings by Trading Standards as a result of firms continuing to target elderly and vulnerable consumers in the Highland area. Consumers are advised, to shop around for a home/fire safety alarm system, locally, before agreeing to a home visit. Previously firms have promised 'free installation' or a 'free alarm' as incentives for allowing sales staff to visit them at home, to carry out a survey. However, more recently, consumers have contacted Highland Trading Standards, with their concerns stating that they are now being offered a 'free home security and fire safety survey visit' to see if their home is eligible for a 'free alarm system'. Join Bob Dawson of the Bumblebee Conservation Trust and the countryside ranger to take a look at our local bumblebees around the Bettyhill area. We will show you how to identify the different species found and hopefully we shall see the very rare great yellow bumblebee. We will safely catch some examples and show you the distinguishing features to look for to help you identify them yourselves in the future. Note - Photo shows the Great Yellow Bumblebee and although rare in the UK can be found on our north coast in Caithness and Sutherland. Residents and Day Attenders from Bayview House in Thurso can now go on-line to keep in touch with families and friends. B.T connections have provided funding for a laptop and internet access for the Care Home residents while the Dounreay Communities Fund donated £250 towards a laptop and broadband connection for Day Attenders of The Highland Council run facility. Shona Munro, from Citizens Online has been visiting Bayview House Day Centre weekly to work on a one to one basis with attenders, to enable them to send emails and research information. Shona hopes to role out this training to residents over the coming months. The Hen night won a second prize - Well done ladies for your impromptu entry to the Gala before heading of to Thurso for your big night out. And for you folk looking in from out of the county - the answer is yes you probably will see folk dressed up on any weekend in summer in Caithness. Volunteers needed - marshall the parade - the job is to help keep the parade moving and ensure that all participants and spectators have an enjoyable experience. Time commitment 6pm - 8.30pm and you will be fully briefed beforehand. If you are unable to help at this event but would still like to help out then there are lots of other events during the week where we could use some help, eg selling raffle tickets, distributing refreshments, etc.